IT isn’t solely about checking off business goals, but becoming an active member of planning, strategizing, and implementing organizational change. The future of IT is supporting more creative, strategic tasks internally. This is the first of five blog posts on internal IT teams and how businesses can best position them for success. In order to empower your internal team to innovate around bigger picture business strategy, you need to cultivate outsourcing relationships to take care of the user ready IT. As Forbes notes, the IT worker is a “tech-savvy innovator who creates change across the organization’s entirety, not just a single department.” Your digital strategists are the heart of your business and they deserve ongoing recognition for their accomplishments and valuable contributions. 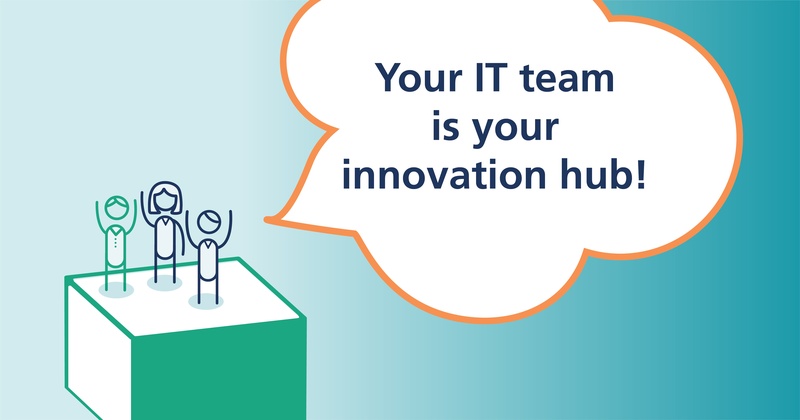 Within your company, recognize your IT team’s value by embracing innovative projects that attract and retain high-caliber IT talent. Lift your team up, as they are central to your success. They demonstrate their commitment by supporting professional development and technical training opportunities for these individuals. Key to uplifting your IT team and valuing their expertise, is respecting their time and the importance of work/life balance. Involve them in your strategic planning processes up front so that they can inform decision making and avoid having to clean up messes downstream, rush to meet unrealistic deadlines, or work overtime due to inefficiencies in the process. Position IT as central to business strategy and success. IT that supports business strategies and solutions is more important than routine maintenance. Clarify your business’ strategy to include your IT partner. Positioning IT as a core segment of your business builds trust, engagement and performance with your IT partner. Here are keys to building a relationship with your IT partner. Execution is also important. Swiftly take action on strategic and operational moves that are important to your business.